Turn off the water when brushing and shaving. You don’t need to keep the water running while you are brushing your teeth! Install low-flow faucets that use a third of the water as conventional faucets. 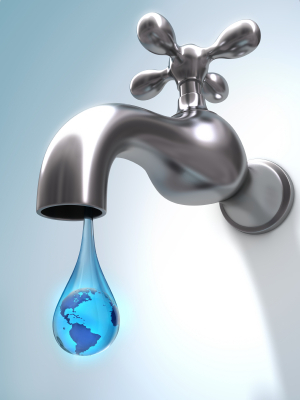 Fix leaky faucets and pipes; you can lose more than 20 gallons of water a day from leaks. Again, install a low-flow shower faucet to cut water consumption in half. When letting the water heat up, put a bucket in the shower and use the water to water your plants or do cleaning. Try and spend less time overall in the shower, and take showers rather than baths. On average baths use 40-50 gallons of water and a ten-minute shower with a low-flow faucet will use only 15. Low-flow toilets! I know I keep repeating this, but it makes a difference. If you can’t afford a low-flow, try putting a plastic bottle in the tank to reduce the amount of water used per flush. Check and make sure you don’t have a leak by putting food coloring in the tank, and seeing if it appears in the bowl without flushing. And finally, if you can stand it, don’t flush after going #1, only after #2!